As a crafter, its always great when you get feedback on your work. And even more so when it comes in the form of a comment/sale/inquiry from a stranger. So this past month has been pretty amazing to me as a crafter. And so without further ado…. let’s roll the tape! So thanks to Gillyweed, Emily and Mike… for making my December one to remember! This morning I woke up a good hour early, and rolled over to peek out the window to gauge the time and…. snow! Like a good inch or so, there was snow on the ground and the tree branches. I was so excited I couldn’t go back to sleep! I love snow… so much that relatives several states away will call to tell me when they get their first snows of the season. But we were on stockings. Ben and I have stockings… we hang ours on the knobs of the china hutch. Its not that we don’t have a fireplace, with mantle, but we don’t have those stocking hooks… and frankly the way I try to stuff them its probably good that I can pull out the drawer below for added stability sometimes! 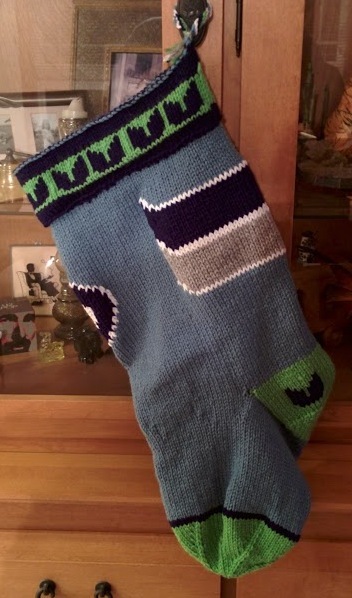 While I did not make quite so many stockings this year, Ben and I signed up for the Redditgifts Secret Santa Exchange this year and I knew I wanted to give our giftees some custom Christmas Stockings full of holiday cheer. My giftee collects vintage hand fans. So I thought a modified Grandmother’s fan design would be appreciated. Stuffed so full I couldn’t even fit that last gift in! 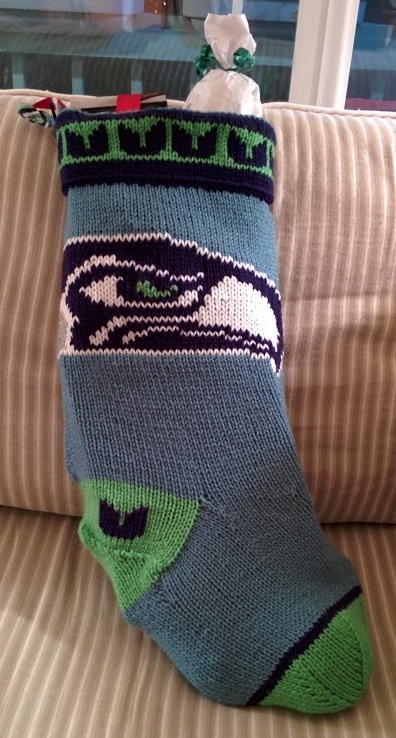 And I did indeed make sure to put 12 feathers on the heel and cuff…. 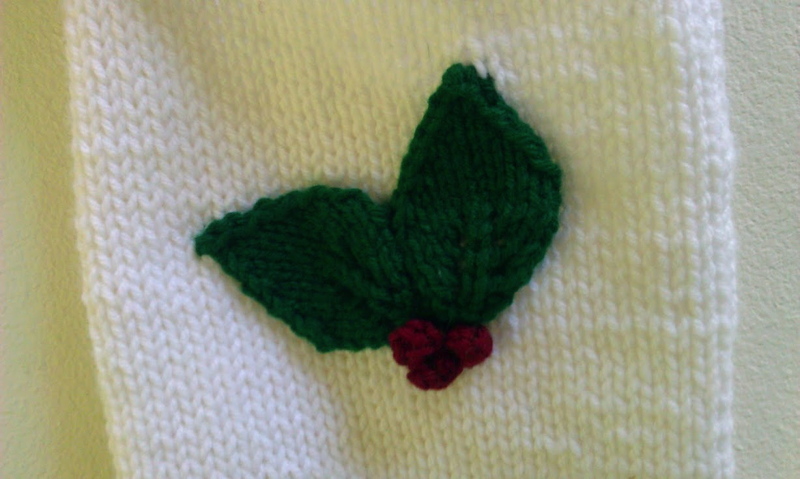 The back of the Hawk’s stocking featuring the rest of the wrap around design. I do hope they like all their gifts, and as with the last gift exchange, (Which was Star Trek in case you forgot!) I will update this post with any response from our giftees. 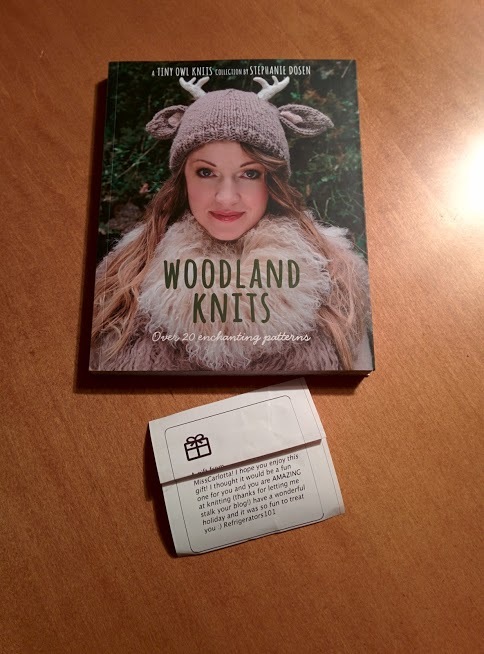 Meanwhile, my Santa was really quite on the ball… she has already sent me a great new knitting book called Woodland Knits. There are some adorable patterns in there to give me lots of ideas in the new year. I say the new year because this week I was all about a pair of commissioned custom StarCraft2 Scarves. And I’ve cast on the second of my sleeves on my Spoke Sweater. So between the housekeeping and cookie making and early Christmas having…. 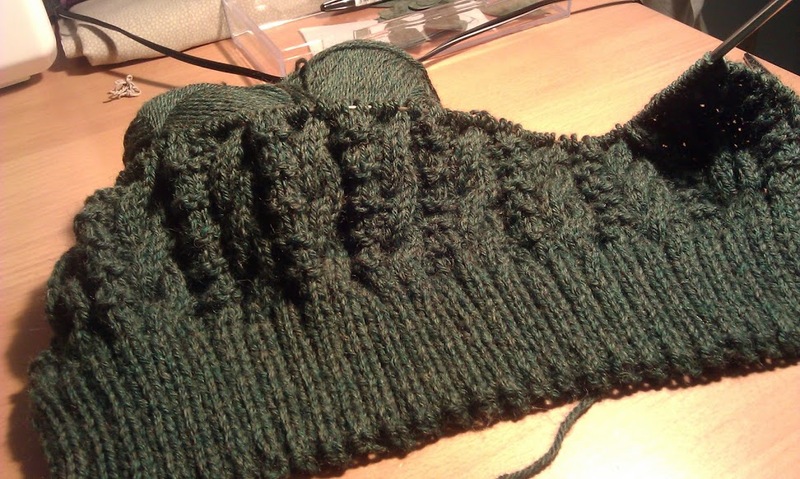 I am knitting like a made fiend to see if I can’t get it done to wear Christmas Day. Just needs some seaming, sleeves and a good blocking! UPDATE! My Secret Santa Giftee received and liked her gifts! And so did Ben’s Giftee (who posted a whole album – click the title) Ben also posted what he received here. Earlier but better photo of my version. So I’m pretty pleased with myself about those. They did take a bit more time than I anticipated, but there is quite a bit of detail work in there. 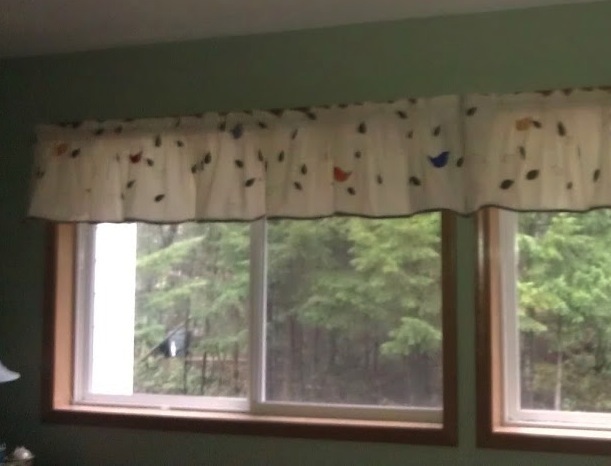 So its curtains for my curtains project! And now for the second bit of the title…..
You know those various tote bags.. the cute ones with bugs that you receive as gifts, and the logo splashed freebies… I have a whole collection of those that I consider my project bags. And its a good thing I have a decent collection….. 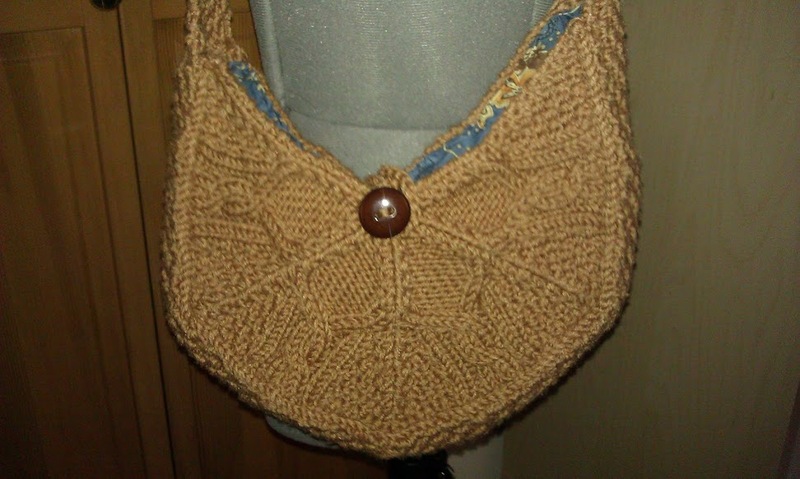 So first off… I made my own handbag this month! Being modeled by my new dress form no less! 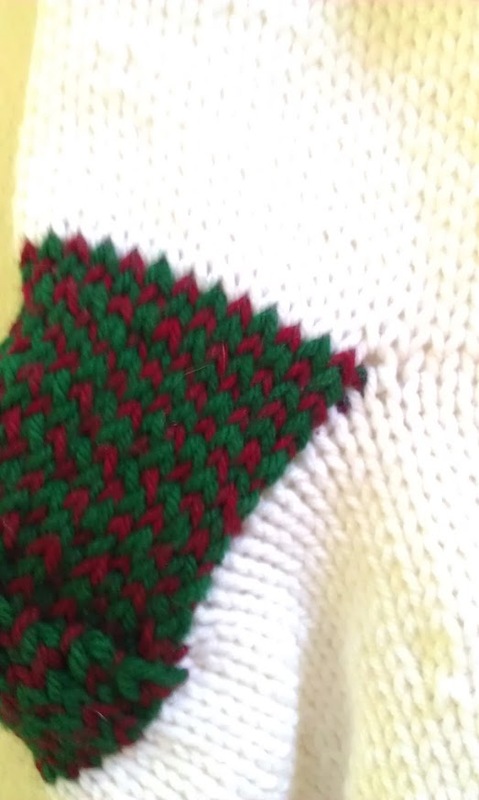 The pattern is called Brea. It came together rather quickly and personally I thought was a good use of some of my Chinese Yarn I purchased from Goodwill. (That link is to the label, if you translate it let me know!) I still have a few more balls of the brown, as well as some pale spring green and pale lilac. Double knitting seems rather interesting, but one of those things where you defiantly need to keep your mind on what you are doing, so it does tend to get set aside. I mostly have this cross stitch done from a kit I picked up ages ago… I just need to tackle the backstitches and the french knots. Its my first project using black aida cloth. FINALLY…. I said I wanted to tackle a pair of sweaters this year and… not only did I finally pick out and order my yarn for the Ben sweater…. Future sweater in the raw. 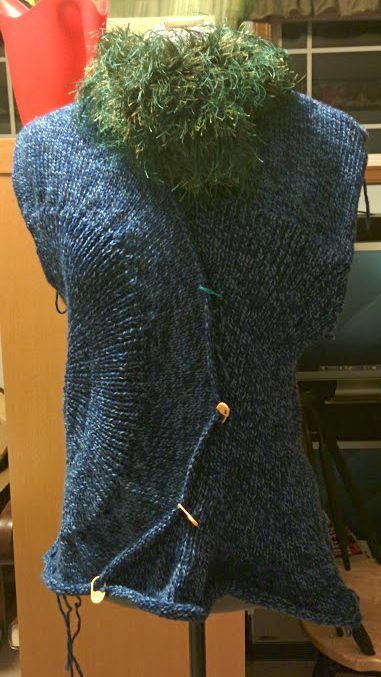 I’m now even further along, but will I finish it before the end of winter? 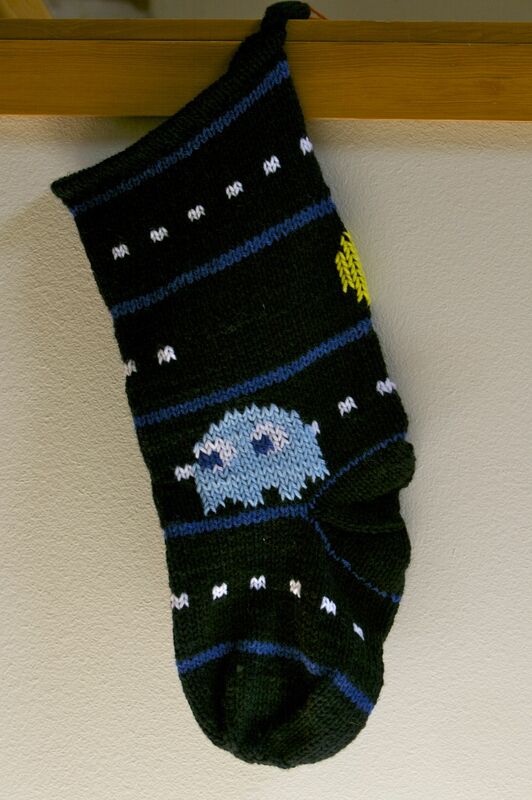 Christmas Stockings are now on Sale! They are all for sale at my etsy shop here: http://www.etsy.com/shop/MissCarlotta minus one already claimed Zelda stocking. Feel Free give me any feedback on my pricing/photography skills/etc! And for those that refuse to click links here’s a gallery of all my stockings I knit this year that are up in the shop. You can also find links to both my shops on the right. Now that you are wondering why I have two shops… well its because of readership. WePay doesn’t charge me to list items only for sales, but the traffic is much smaller. Etsy does charge me to list items, but there are slightly greater odds that someone will see the shop that maybe hasn’t been to my website. September: So much to do…. how about some leaves and berries? So September has just flown by, and unfortunately the memory card to the good camera is having issues and so I need to get a new one… so this means rather poor quality photos this post. My design this month was more traditional in nature although the implementation felt a little masochistic… which sometimes family holidays are that way aren’t they? 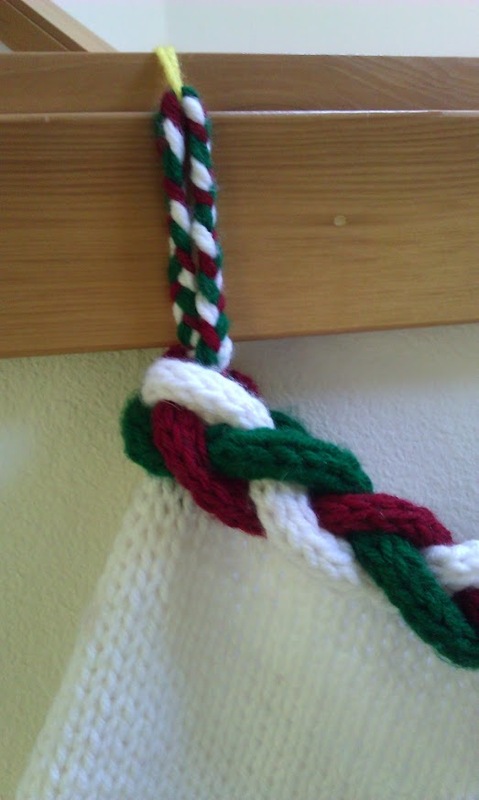 Cuff and hanging loop… they look similar but are done very differently. When I got down to the heel I thought how nice it was to bring those colors back down the sock a bit more… so I went with a heel of alternating red and green. 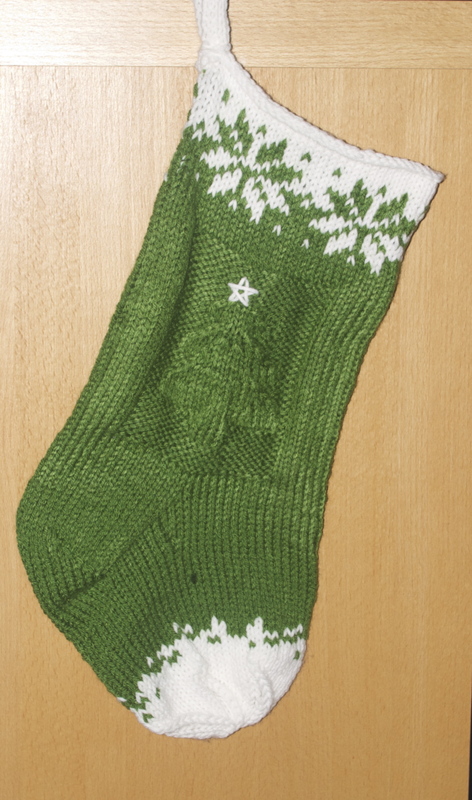 This wasn’t too bad at all in my opinion, though it was a bit interesting as I started to turn the heel. 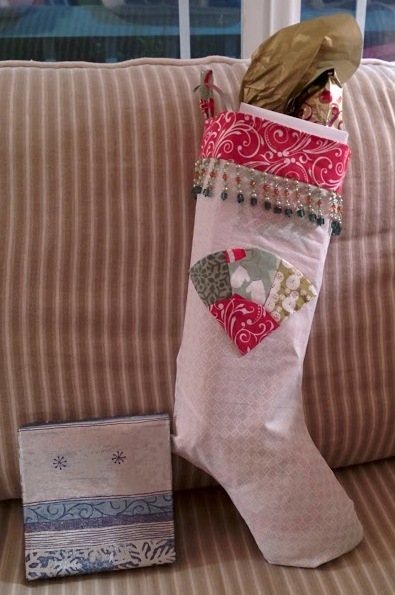 I can’t say as I’m super thrilled with this one, but it is a whole stocking and it was a bit more to learn and try than some of the others so I’m putting it in the win column. 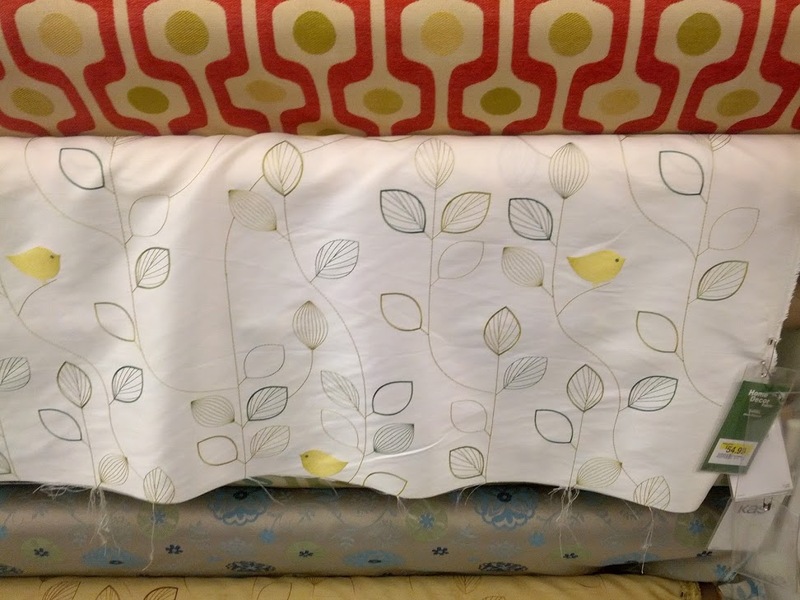 What you haven’t seen is a nearly complete third quilt, which will be a gift…. 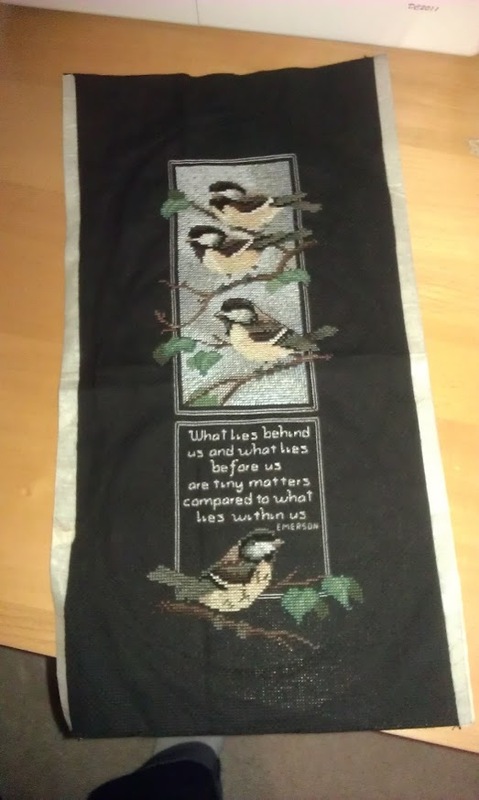 a cross stitch gift I have about 1/2 done… and my counterpane project I am designing and building. I am now on pane #3. 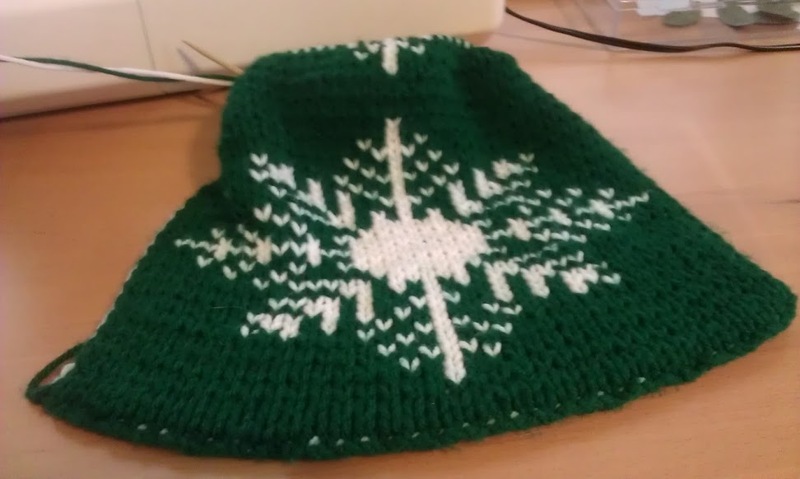 The first pane took quite some time as I was designing, the second pane I was writing out the pattern and now I’m knitting from the pattern to make sure I got it right. 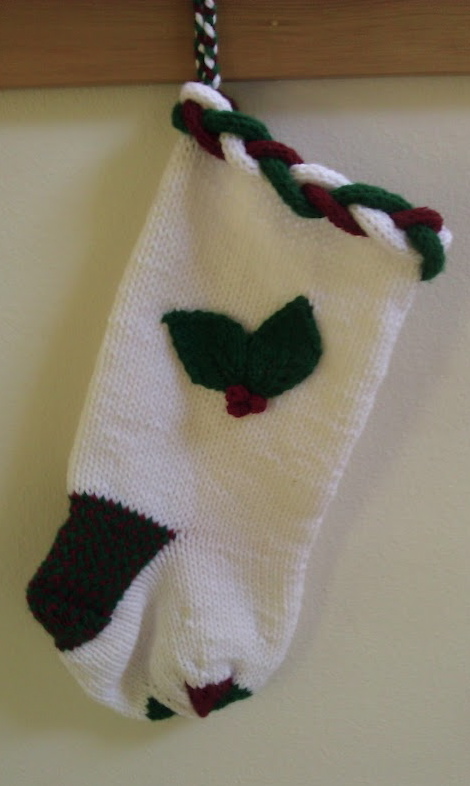 I am also slowly but surely working on getting my etsy shop ready for a relauch with all these stockings. 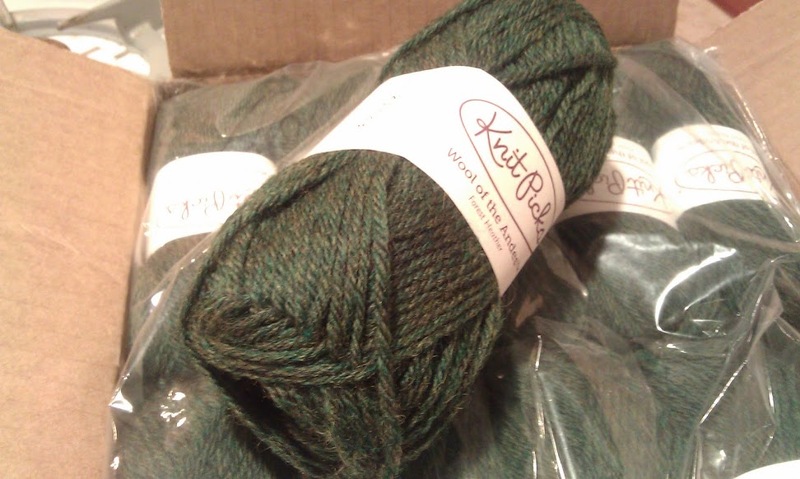 After all something needs to feed my yarn habit! Well I tossed about several ideas… went looking for patterns and finally just decided to have a more traditional looking stocking. Green and White is always right. The cuff is a pattern you can pick up for free from ravelry I spent quite a bit of time the other day going through patterns looking for a cable from a Duncan McLeod sweater… and that was one of the extras I stumbled on. The tree however…. is a true original. No pattern… just winged it! 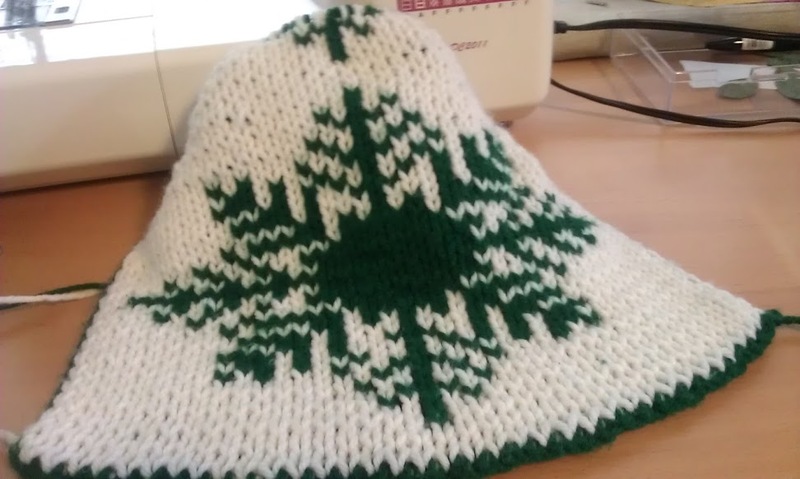 There was a bit of cabling, a bit of increases and decreases… and I’ve been assured by the ever critical Ben that it does indeed look like a tree! Felt like a real accomplishment! So now I’m at 11 stockings for the big sale of 2012. 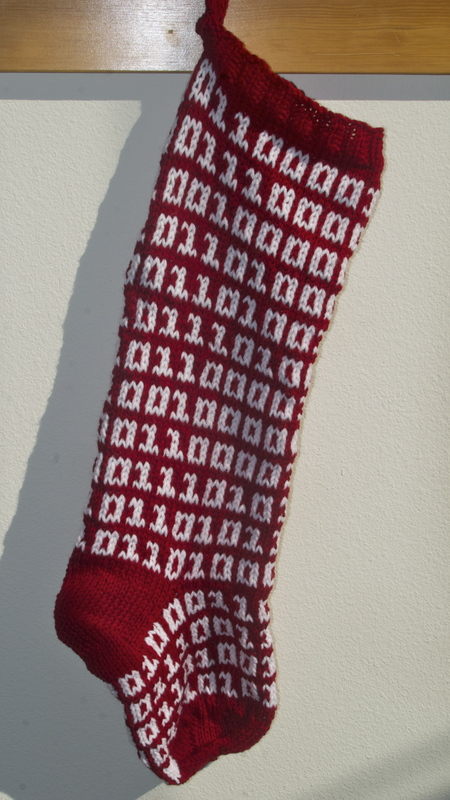 Knitting and Binary are actually quite similar, in knitting there are two basic stitches… knit and perl. 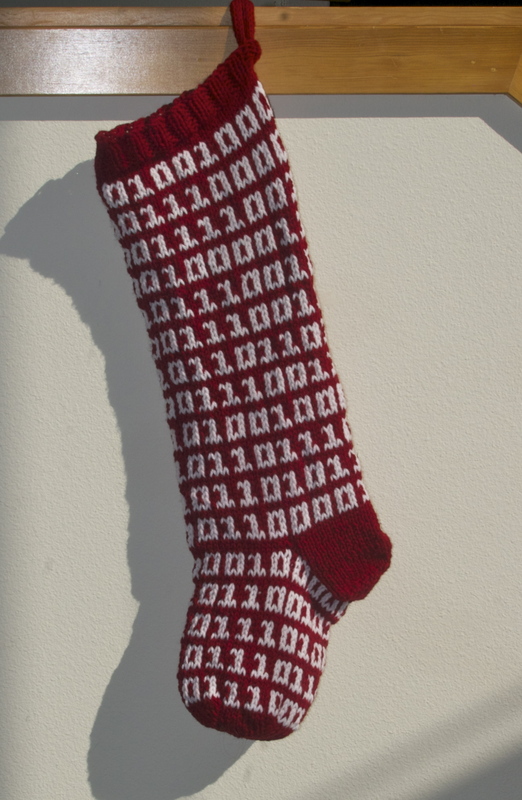 So this stocking celebrates the pure geekery of binary! For those of you that I know would spend hours attempting to decipher what it is on this wrap around design I’ll give you the code and the means to translate. So technically its the 1st of July, but since one of these was completed completely in June and the other just needed a hanging loop, I am still counting them both as June. During June I was out of town for two weeks… and so had to rely on what yarn I could fit in my carry on and loaner scissors for part of these projects.. so I figure a few hours into July isn’t technically cheating. These both feature one sided designs, with crochet cuffs. The Alliance Lion has a scalloped edge cuff, and the “after thought” heel. By the Might of the Lion! 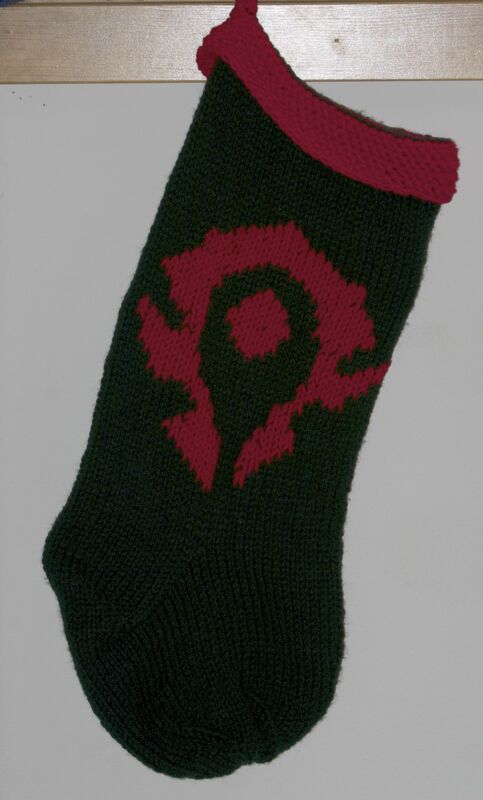 The horde stocking has a traditional turned heel and a straight cuff. I contemplated going white instead of black, but Ben gave me a bit of the side-eye so stuck with traditional black. May Bonus: Dammit Jim! Its a Stocking not a Doctor! 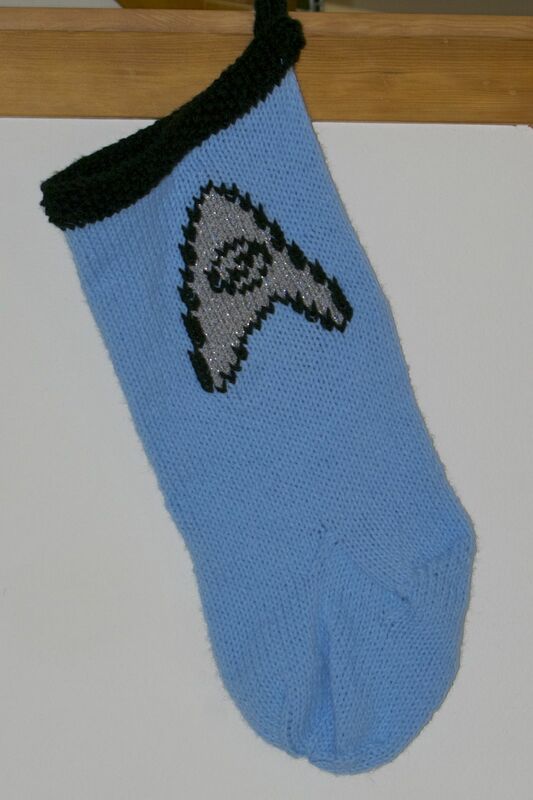 So as a follow up to my January “Kirk” stocking… here’s one for those not in command… an original series science officer stocking. 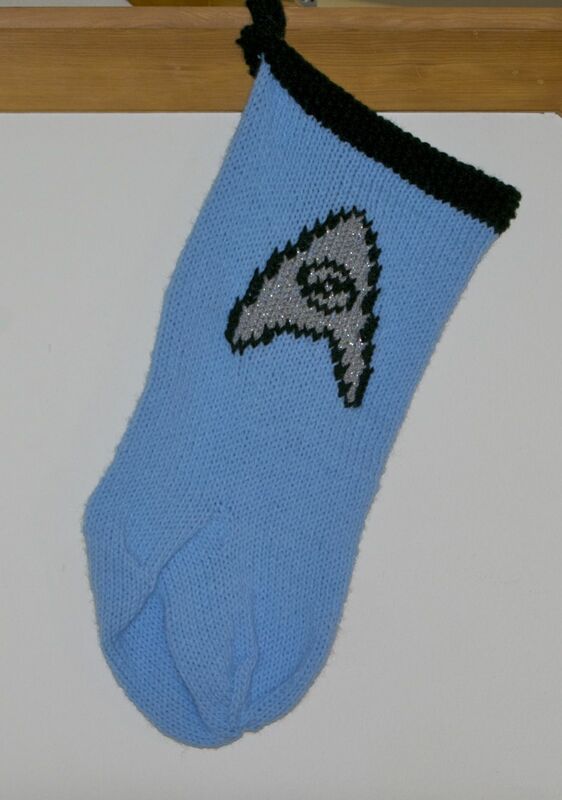 Like the “Kirk” this one also features the design on both sides. 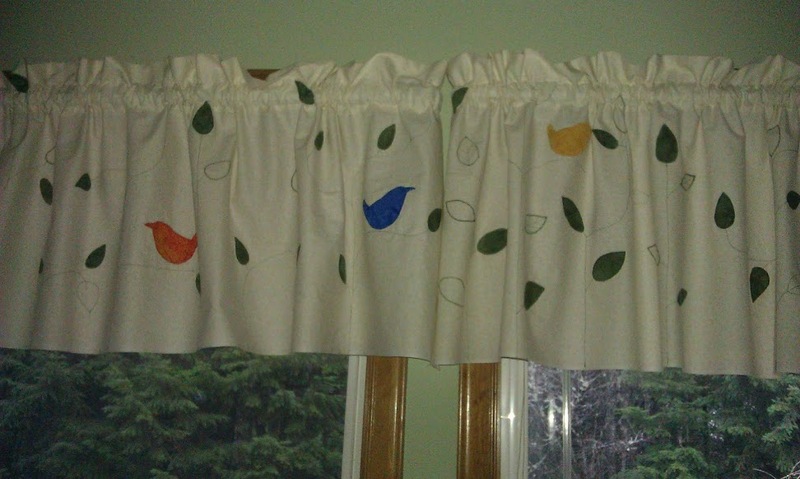 Right Side – Logically this means you can hang it facing either way! 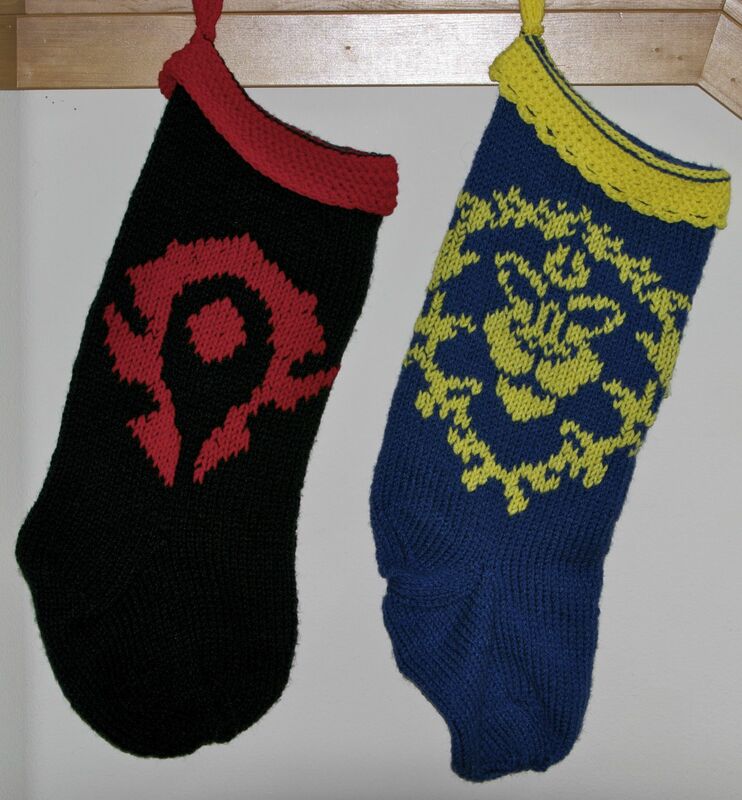 I have had this stocking idea rattling around in my brain for a bit, and was surprised at how quick it actually ended up coming together. I used the after-thought heel method, and while it is certainly quite a bit easier when you are laying out the design phase, I’m not 100% sold on the final product look. 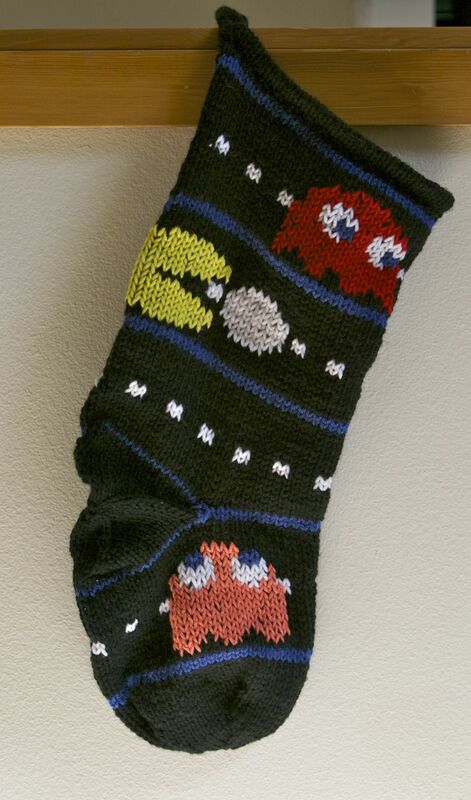 I am however… somewhat happy with how the stocking design came out. Its an all over design, which I think is extra nice.